In a culture that praises blending in over standing out, productivity over purpose, and noise over truth, many women find their God-given voice compromised, quieted, or even mocked. We all long to live out our divinely designed passions and unique talents, yet too often it becomes so much easier in the face of opposition to stay silent altogether. What if God is calling you to so much more? As a working mom, wife, artist, and abolitionist, Natalie Grant has struggled to live on purpose while battling the worldly demands of keeping up the appearance of perfection. 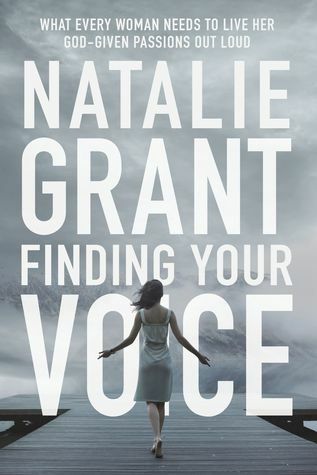 Emerging from her own dark spiral of suffocating inadequacy, Natalie found fresh hope in the truth that God has already given women everything they need to live out their God-given identity, passions, and calling. Finding Your Voice offers the heart-rallying, life-giving truth that a woman’s voice is not an uncalled for interference to be silenced, but a gift to be used for God’s Kingdom purposes. In voice lessons as in life, a strong vocal identity requires us to first stand firm, breath deep, and finally, go for it—loud and clear. I have always enjoyed Natalie Grant's music so I was curious to see what else she had to say. This book is fairly short and to the point. I liked how it was written and it gave some good examples on how we can manage our life from a Christian perspective. Chapter five was most helpful for me especially the last part about clothing. While this book isn't necessarily something new to me, it was a good reminder on what our focus should be about. "I received this book from BookLook Bloggers for free in exchange for an honest review."